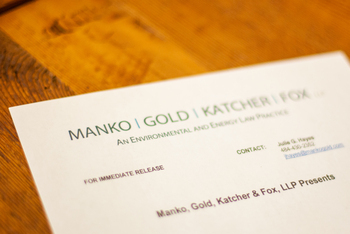 Philadelphia, PA (January 4, 2011) – Kate Campbell has been promoted to partner at the firm of Manko, Gold, Katcher & Fox, LLP (MGKF), the environmental, energy, and land use law firm based in Bala Cynwyd, PA. Robert D. Fox, managing partner of MGKF is pleased by Campbell's advancement. He said, "She is richly deserving of this promotion. She is an outstanding lawyer, has done an excellent job managing the summer associate program, and is an overall credit to the firm." Campbell's practice focuses on environmental, toxic tort, and class action litigation, as well as on regulatory compliance matters particularly involving federal, state, and interstate water pollution. She has successfully represented industrial and commercial entities, as well as closely held companies, in a variety of complex environmental litigation matters. Campbell has also been involved for many years in activities involving Total Maximum Daily Loads for toxic pollutants in the Delaware Estuary, advocating on behalf of individual clients and a regional coalition of industrial and municipal dischargers.